Picking your own fruit is not only the freshest method available to get fresh fruit in your kids’ mouths, it’s also the most fun. All you need is the enthusiasm, a child or two and an accessible Pick Your Own, or PYO farm. PYO farms became popular after World War II, when farms and other outlets couldn’t afford containers to package their produce. They are still hugely popular today, and for some businesses individual picking provides a considerable share of their profits. For customers, visiting a PYO farm is much cheaper than buying berries in the supermarket, for example, so you will save yourself a bundle. Just be sure you have plans for the fruit you pick, so it won’t go to waste. And don't forget - some farms have vegetables for you to pick as well! One way to get your children really into the whole PYO experience is to do a little research beforehand. Find out what type of fruit you will be picking, then encourage them to dig a little deeper. 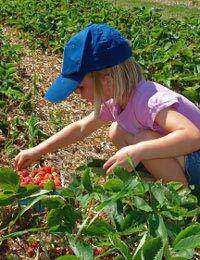 For younger children, that could mean simply drawing and colouring in pictures of the fruit you’ll be picking. Older kids can look on the Internet to find Ten Fun Facts About Strawberries, then compile them in a small book or make a poster. Another educational game could be to make a menu incorporating the fruits you’ll buy, and then cooking up the meal when you come home. If you are picking strawberries, you could have a strawberry smoothie starter, followed by the main course and ending with a strawberry tart. Encourage the kids to use their imagination, as the sky really is the limit when it comes to preparing dishes from fresh fruit and veg. Peppered Beef with Balsamic Strawberry Relish, anyone? Look online. It’s not usually hard to find a PYO farm. Surf the Internet to see what farms are in your immediate area. If you have to go out of town, make a day’s adventure out of it. Some family-friendly farms offer PYO as part of their overall menu, meaning you can enjoy a picnic or café lunch and maybe even pet some farm animals while you’re there. Call ahead. You might just assume that you’re right in the middle of the raspberry season, only to arrive at the farm to find you’re a week late. Check the weather. It’s not really worth making the drive and getting the children all excited only to encounter the biggest storm of the summer. Play it safe, and change your plans if the weather looks really bad. Read – and obey - the signs. You are on someone else’s property when you visit a PYO farm, so encourage your children to be respectful If a sign says “Keep Off”, then keep off! Similarly, do not allow your children to enter closed buildings, climb trees or annoy animals. Wear the right clothes. This doesn’t mean just wearing t-shirts and jeans. If you intend to pick peaches, for example, long sleeves are advised to avoid getting peach fuzz on your skin, which can be an irritant. Apply sunscreen. Don’t underestimate the heat of the sun in a field. Sun hats are also advisable. Bring a bucket. Many PYO farms charge by weight, while others charge by the container. The majority provide buckets or bags for you to use to collect your fruit while on the premises, although your fruit will be put into a paper or plastic bag to take home. Some, however, require that you bring your own containers, so find out beforehand. Getting plenty of fresh fruits and vegetables in your diet is important, especially for children. Picking your own fruit is not only healthy, it’s a way to support the local economy, save money and have fun at the same time. Best of all, you won’t hear that familiar “I’m bored!” all day. Remember, many PYO farms also have on-site shops selling a wider variety of organic fruit and veg than they sell on their farm brought in from the local area, so you can incorporate a wider variety into your meal when you get home. So why not make a day of it and get picking!